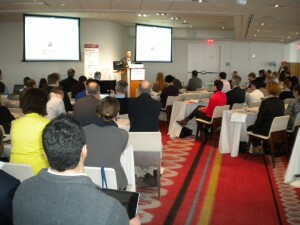 A few days ago we did a presentation at the Sentiment Analysis Symposium of New York. In our talk, we explained how to use text analysis technologies to listen to the different Voice of the Customer channels and get customer insights. For companies is vital to understand the opinions that their actual and potential customers express in new channels that are much more spontaneous and less structured than the traditional surveys (e.g. answers in questionnaires, interactions with contact centers, conversations in social media). The reach, the immediacy and the “emotional“aspect of these channels make them an impressive source of raw materials for obtaining valuable insights. For this reason, brands are expanding their VoC initiatives towards that new territory, made of unsolicited and unstructured comments. However, the characteristics of volume, variety and velocity of these sources makes them untreatable exclusively by human means (think, for example, that only on Twitter a big brand can generate thousands of mentions a day in several languages… and some of them with the potential to trigger a reputational crisis). Our vision at MeaningCloud is that VoC initiatives can benefit from the massive and quick treatment of unstructured information provided by text mining and sentiment analysis technologies. Currently, semantic analysis software tools enable to extract the meaning from all the company’s interactions with their customers and markets. Thus, conversations by email, phone and social media can be brought into the VoC equation to contribute all their reach and spontaneity. Customer. Our tools allow profiling the customer and add his/her interactions in a 360 degrees view. This helps to detect buying signals or support requests, identify in which stage of the “customer journey” the customer is, detect churn and other potential risks, identify influencers, promoters and detractors, engage customers and manage the conversation. Product. We can generate insights around problem/customer and solution/product dimensions. That helps the company to discover unmet market needs, generate ideas for new offerings, identify missing features in their products, assess customer satisfaction, or compare against the competition. Corporation. We can aggregate the public opinion and the media coverage around predefined axes that have an impact on corporate reputation (e.g. innovation, leadership, social responsibility or sentiment in the stock market). That helps the company to prevent reputational crises, benchmark against its industry and rebuild its relationship with the public. With the current state of technology, the combination of storage and management of unstructured content with automatic text analysis provides the tools to unleash all the power of the VoC. As you may know, at MeaningCloud (Meaning as a Service) our commitment is to provide the easiest and more productive way to incorporate semantic processing in any system via our APIs. In this view, it is a pleasure to announce that we are working on a new API focused on the Voice of the Customer / Customer Insights. Our idea is to include specific functionality to analyze the customer’s journey, the brand’s personality and the corporate reputation so that you can integrate it into your applications or use it from a simple spreadsheet. If you wish to have more information, do not hesitate to contact us… or stay tuned to this channel. 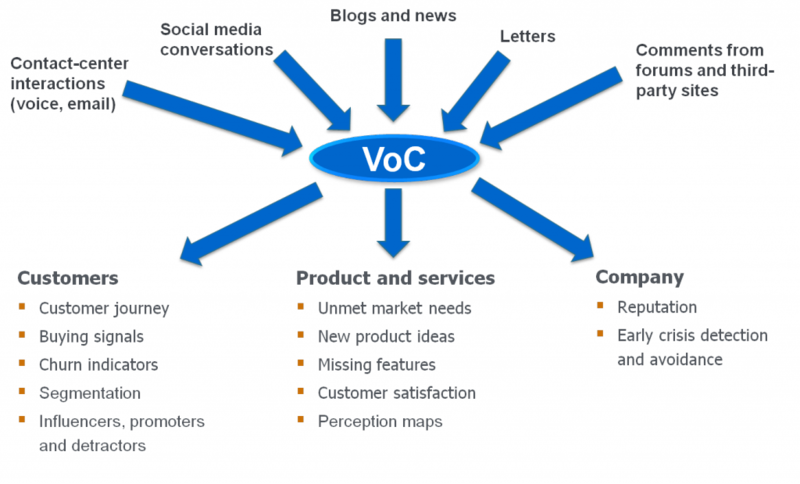 Voice of the Customer (VoC) initiatives to a new territory of unsolicited and unstructured content: comments on surveys, call center verbatims, Twitter… Only automatic processing enables to perform this analysis with the the necessary characteristics of quality, volume, response time and homogeneity.